Today is the last day of work for our Annika, as she is due to go back to Germany and continue with her studies. It has been lovely to work with her and get to know her, she is a free-spirited and adventurous young person. We have decided to interview her about her experience in the UK. Why did you decide to come to England? I decided to come to England because of the language and because I was interested in the seeing a new country which I had never been to before. I planned on doing this trip this year because I didn’t know how the work visa situations would evolve after Brexit. How did you feel before you left Germany? I was excited about coming to the UK and seeing the country, because I had never been to England before. It was a new experience for me and I didn’t know what to expect from my host family or my workplace, even though I looked everything up on Instagram and Facebook. On the day I left I was scared of the flight, because I had never been on a plane without friends or family and I was scared that I couldn’t find my bus connecting to Bournemouth, but I found it and didn’t have any problems on my way to my host family. How were your first days in the UK? My first days in the UK were really nice. I spent my first day with a person who also lived with my host family and he showed me around Bournemouth and which bus to take. I learned how to play pool on my second day from my housemates and I soon grew used to my new host family. At first I was very nervous and I found it difficult to understand the British accent, but after two days it was no problem for me any more to understand most of the people. What is your favourite moment in the UK? I had many really nice moments during my time here. I can’t decide which one is my favourite. 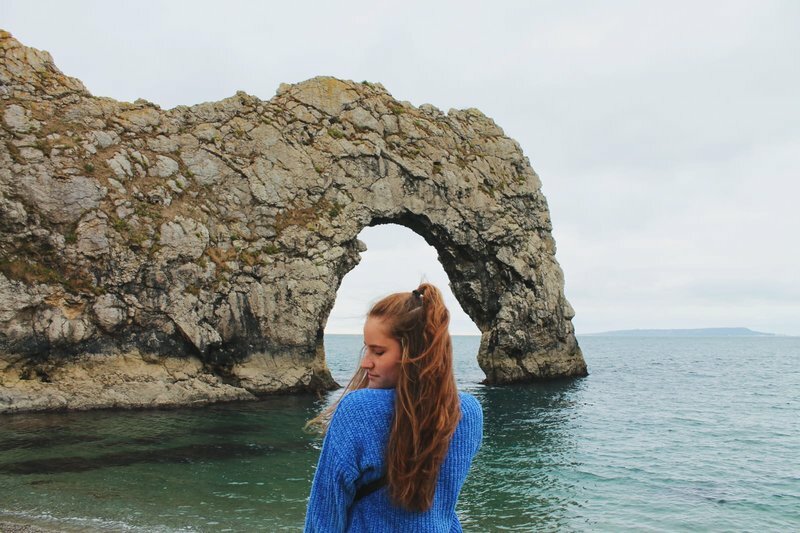 I went to the Old Harry Rocks and to the Durdle Door, these were two of my favourite days. I also went to the Arts by the Sea Festival, which was also a highlight of my trip. My favourite place to eat here is the cat café. A new experience was that my manager Justin invited me to a Jazz concert with my work colleagues and I had never listened to live Jazz music before. I will remember the friends I made, my host family and my workplace a lot. I have grown more confident and more independent because of this trip. It has inspired me to travel more and explore the world. What would you advise a young person who wants to travel? I could recommend staying with a host family because you get to experience the English culture. Be brave and step out of your comfort zone. If you could, try to travel alone because you have the opportunity to make new friends. Even though it seems scary at first but if you do it, you can have a great experience and maybe you will learn something new about yourself too. Describe your journey with 3 words. Tell us your favourite travel quote. Fernweh: an ache to get away and travel to distant place, a feeling even stronger than wanderlust. Next:Our new, exciting and exclusive furniture range is here at Scape!